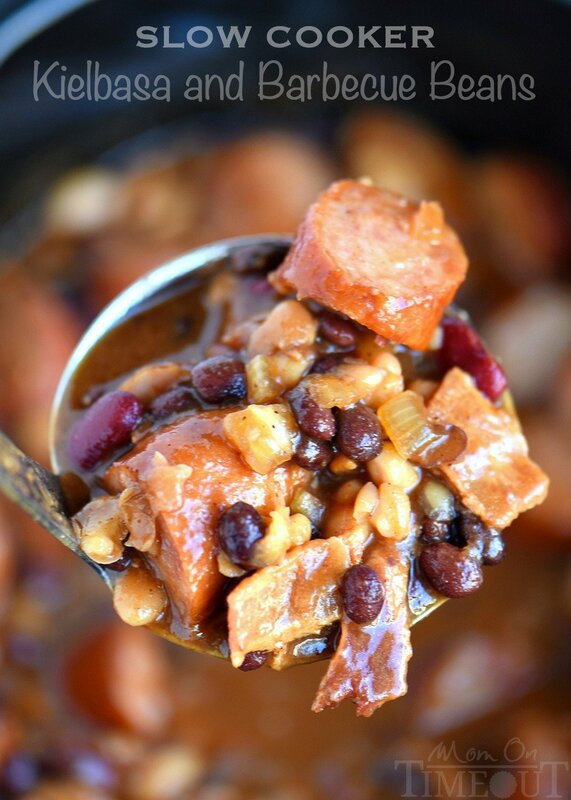 Slow Cooker Kielbasa and Barbecue Beans is the perfect chilly day recipe! 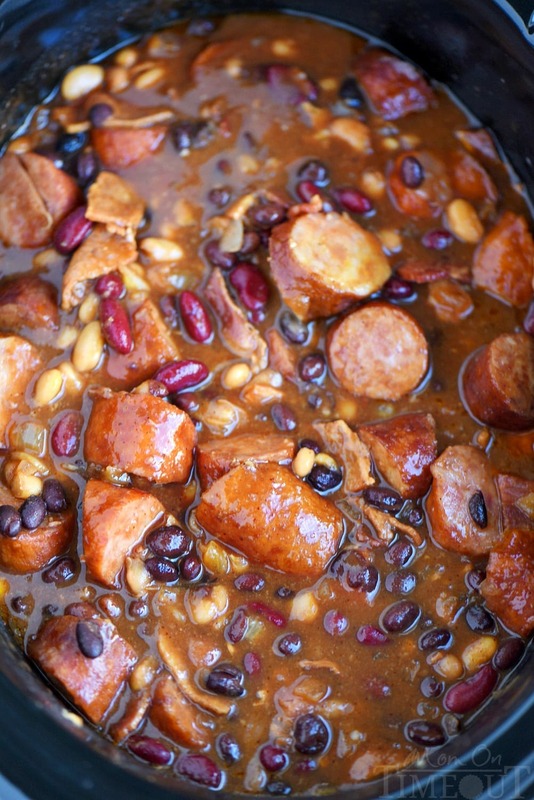 Made with three different beans, molasses, bacon, and kielbasa – it’s pure comfort food! Every Sunday, without fail, Chris asks me to make chili. He loves being able to watch football and grab a bowl of chili and eat it whenever he likes. My boys are big on chili too. They like me to warm up flour tortillas, spread the insides with melted butter and then roll them up. They dip that into their chili. Try it – it’s pretty spectacular! As much as I love chili, I get a little tired of making it. So last week, our Sunday chili turned into this Slow Cooker Kielbasa with Barbecue Beans. It has all the components of chili that they love, but with a lot more flavor. I used three different beans, maple syrup, molasses, and a bunch of other ingredients that you likely have in your pantry for the base. In a moment of weakness, I opted to add in bacon, because, well…bacon. My favorite part of this dish is the kielbasa. 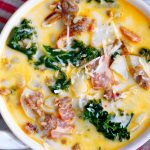 I love kielbasa and I like to keep it on hand for quick breakfast scrambles or easy dinners like this Kielbasa, Peppers, and Potato Hash or this Cheesy Kielbasa, Rice and Broccoli Skillet. I added two full ropes of kielbasa cut into chunks to the top of the rest of the ingredients and let me slow cooker do the work for me. 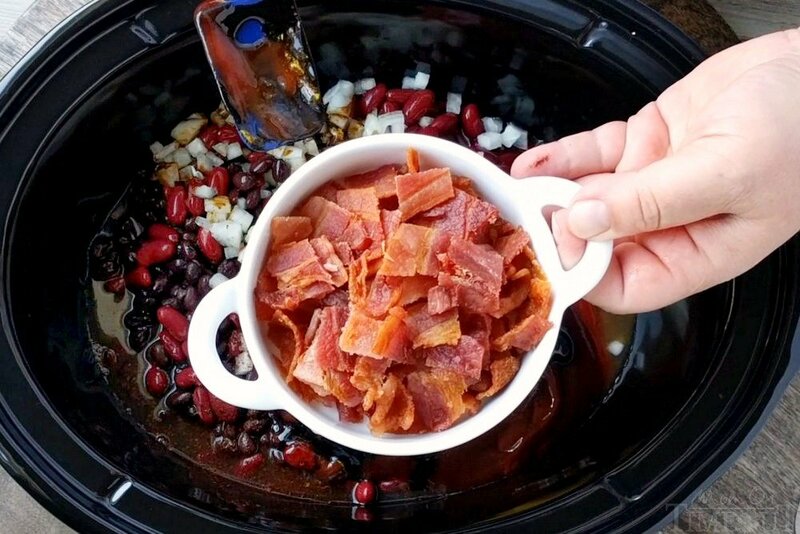 Slow Cooker Kielbasa and Barbecue Beans is the perfect chilly day recipe! 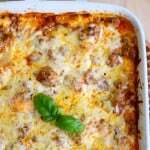 Made with three different beans, molasses, bacon, and kielbasa - it's pure comfort food! 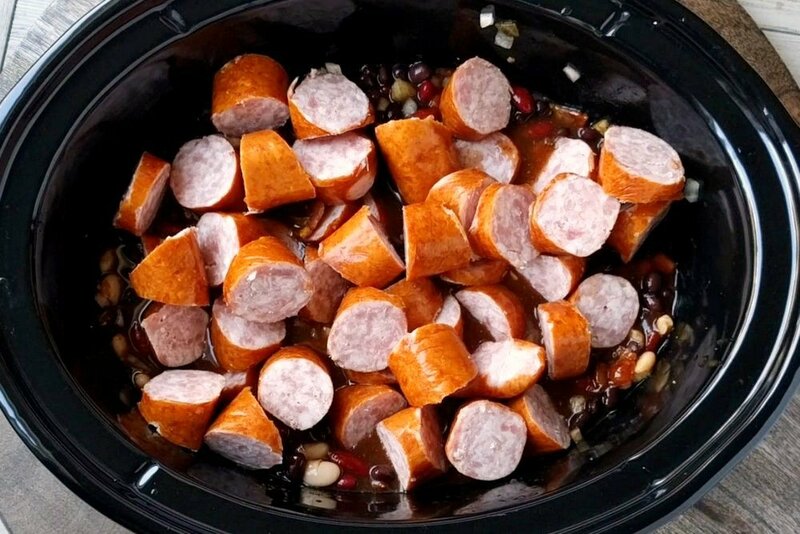 In a large slow cooker, add all of the ingredients except for the kielbasa and stir gently to combine. Place the kielbasa on top and cover with the lid. 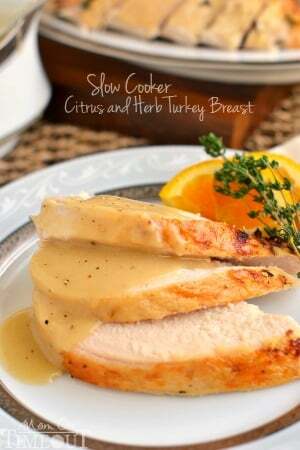 Cook on low for 6 to 8 hours or high for 4 to 5 hours. Stir in the kielbasa before serving. 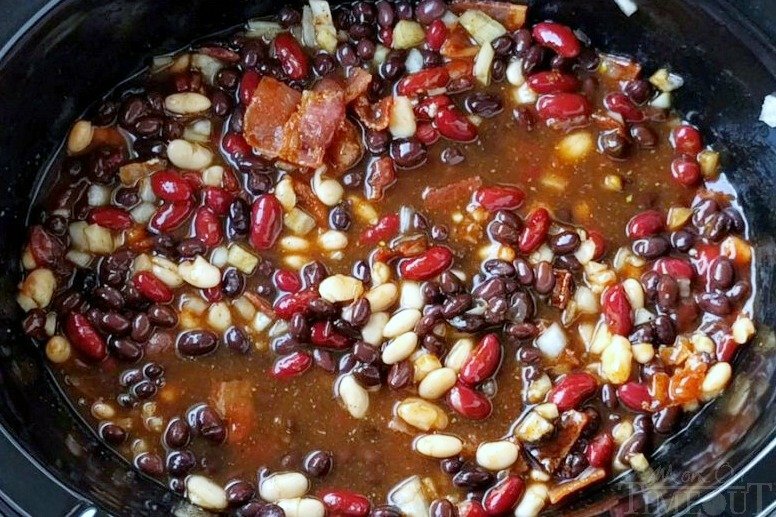 I recommend the low setting for this recipe because on high, the beans tend to get dried out. 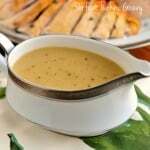 If you need to cook on high due to time constraints, monitor the beans and add more broth or water if necessary. 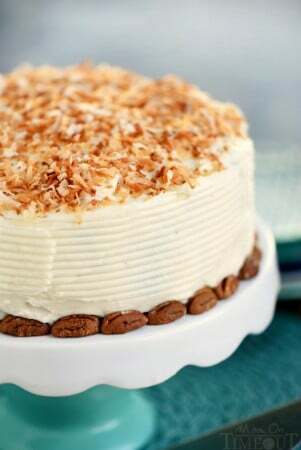 …this Slow Cooker Carrot Cake with Cream Cheese Frosting. 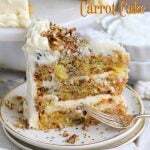 The moistest cake ever! 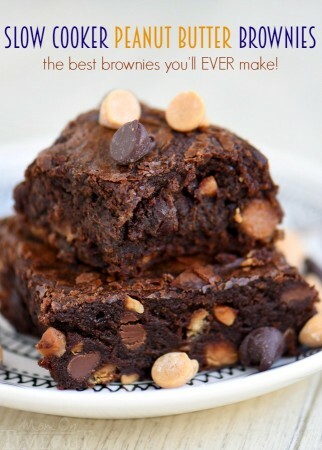 And these Slow Cooker Peanut Butter Brownies – talk about fudgy! 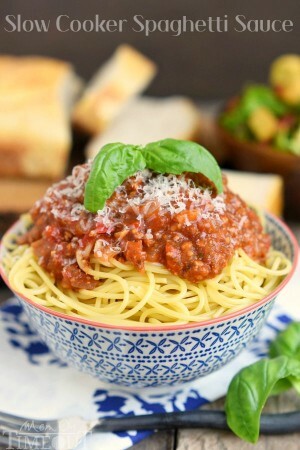 One of my favorites to come home to – Slow Cooker Spaghetti Sauce! A favorite with my boys! A lifesaver at Thanksgiving, Christmas…and Tuesdays! 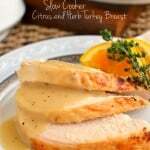 Slow Cooker Citrus and Herb Turkey Breast – you’ll never want to make turkey any other way after you try this! Have made this numerous times. My hubby needed a “chili” to take to work one day, I made this and they are still raving to him about it. 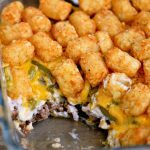 I also take it to work when we have a pot luck… such a great recipe. I don’t make any modifications, we love it as is. Thank you so much Wanda! It is definitely a good alternative to chili. Thank you for stopping by! Currently got this cookin smells great. Making jalapeno/cheddar cornbread to go with it. Sounds like the perfect dinner to me! THIS! Is amazing! I changed kielbasa for Andouille and maybe added more bacon, but hey it’s bacon afterall. Everyone raved for a couple of days. The leftovers went neatly packed into the freezer and were gone by the end of the week. This will be made again and again. Thank you! LOL! More bacon is always a good idea 😉 So glad you enjoyed the recipe Teresa! Thanks so much for stopping by! Making for dinner to pour over rice with pineapple chunks! Can’t wait THANK YOU! I made this yesterday. Delish. I had to stop myself from getting a second bowl. My sister, also my neighbor, came over with a Lock & Lock container to « help » me put away the leftovers ?. This recipe is a keeper. Lol! I love that!! 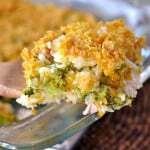 We love making this during the fall and especially on game days – so good! I made this as written using turkey bacon and beef smoked sausage (we don’t eat pork). 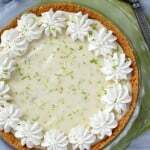 It is delicious! Next time I would use a lot less broth because it made SOUP. I would prefer more of a thick stew texture. Otherwise, a real keeper! So glad you like it Tam! Is the kielbasa you call for already cooked? That’s all I’m finding. All kielbasa is already cooked. 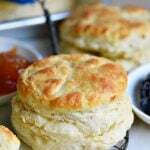 Hi, I have made this at the Firehouse a few times and the fellas absolutely LOVE it! 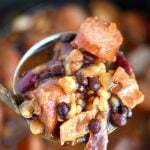 Although I changed the name to Maple Lodge Sausage Bacon & Beans to make it more appealing. I also seared the Kielbasa in a Iron skillet to lock in some flavor. Its so easy to make and not have to worry while we run calls. 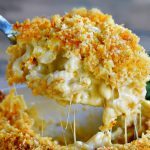 Has anyone tried this recipe with an Instant Pot? Did you have to make any modifications. I just made this for the IP. I sauteed the bacon, and onion and the kielbasa. Add the broth and make sure to deglaze so you don’t get the burn error. Layer the beans on top. 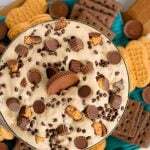 Mix all other ingredients in a mixing bowl and pour in last. Set at high pressure for 15-20 min. Quick release steam. You can thicken up with cornstarch at the end if you like. So I totally want to try this in the instant pot now Alice 🙂 Maybe this weekend!